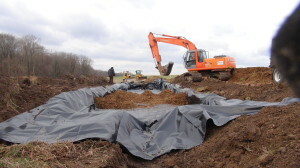 The basic tenant of this practice is to “keep clean water clean.” This practice retrofits existing animal waste storage structures that may not have runoff control. Runoff controls help prevent runoff from upslope areas and roofs to the feedlot or “loafing” area of animals. By controlling this runoff, potential waste nutrients to streams is kept in an area where it can be better managed. Benefits include: improving water quality; reducing soil erosion; increasing infiltration; and protecting buildings and other structures from water damage. Funding provided by the Maryland Agricultural Water Quality Cost Share (MACS) Program, the Chesapeake and Atlantic Coastal Bays Trust Fund and the U.S. Department of Agriculture’s Environmental Quality Incentives Program (EQIP). Keep roof runoff systems clean and free of debris and obstructions that reduce flow. Inspect regularly and perform repairs to ensure proper function. Maintain grassed areas around the structure. Fill in low areas and re-grade as needed using materials like those originally installed. Does runoff need to be diverted away from structures or contaminated areas? Will the runoff be collected and used for other purposes? Obtain necessary permits and authorizations before construction. Follow Natural Resource Conservation Service design specifications. Runoff may empty into surface or underground outlets. Outlets must not discharge near wells, septic system drain fields, basements or buried tanks. Discharge runoff a minimum of five feet from any building. The discharge area must slope away from the structure. Avoid discharging outlets directly into surface waters. When feasible, divert runoff onto pervious landscapes such as lawns, infiltration trenches and natural areas to allow infiltration of runoff.